First attempt at an easel card. I'm amazed at how easy these are - and really effective! 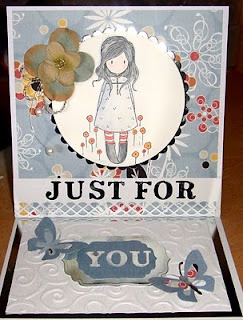 I've used my new paper collection - No Worries, by g.c.d studios. I got it from the craft santa! I've also decided to try and use more beads in my cards. These little bugle beads and pearls are threaded onto 28 gauge silver craft wire from Bead Smith. 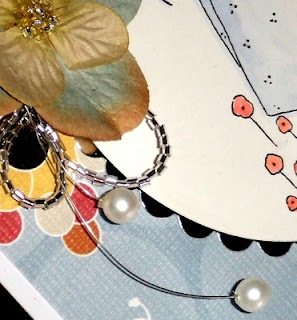 Just need to try and get my inspiration by to keep crafting! Hi Tracy. This is beautiful. Love the colours and that image is just fabulous.